The full blast of summer is upon us in Mumbai – sweltering days and nights, feverish heat, suffocating humidity. It’s been a summer of record-high temperatures for the city, burning through the forties, disrupting the rhythm of urban life, and unbalancing natural forces that keep our farms healthy. The idyllic Shakespearean mid-summer’s night of pleasant weather and pleasanter dreams, has become a sweaty and sordid nightmare for many! By far, the top scorer this season is okra/bhindi. A friend had passed along seeds of this short, but densely-producing variety (thanks, Albertina!). 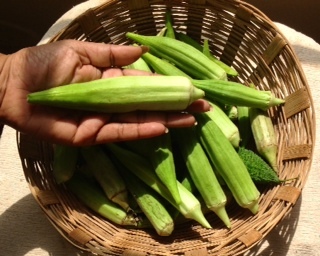 And I have been amazed at the number of flowers and buds, and rapid turnover of giant, tasty okra, such that I have never seen in the markets of Mumbai, ever! 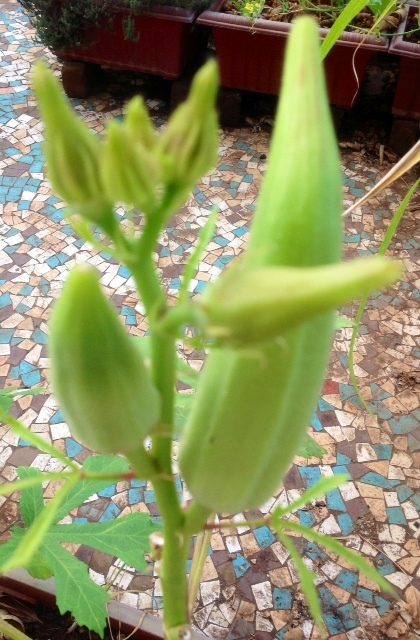 Giant Okra – each full grown fruit about 8 inches long! 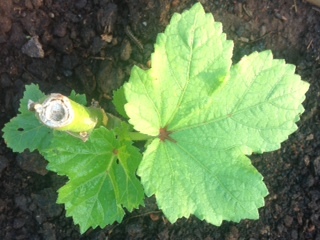 Only two plants (of ten) developed disease at sapling stage, but after pruning them at stem (see pic at left above), they sprung fresh leaves and grew healthily thereafter (see pic at right above). The second scorer of the season would have to be watermelon/tarbooz (please see my previous post – The God of Big Things). Glad to say, the fruit is now ripe and ready to be eaten! Third place would have to go to the bitter gourd/karela. The seeds, most obstinately, refused to sprout until the season was nice and hot for them (early March). But once they got started, they spread their pretty yellow flowers and tendrils far across the terrace trellises, as attractive as any ornamental plant, giving out a regular line of bitter fruit each week! 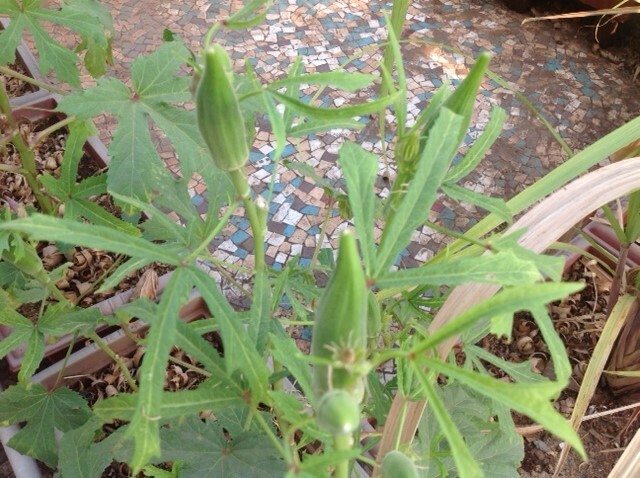 Bitter Gourd – here’s a little fellow planning to grow big! Far behind the bitter gourd are the eggplants/baingan. This is my first season growing eggplant in Mumbai, a veggie that I do not take kindly to (…the world they say, is divided into two types of people – those who love eggplant and those who hate it…) My folks brought me several saplings from our village (thanks Mom & Dad, for still trying to make me eat eggplant! ), and after an unusual number of early deaths, the surviving plants finally blossomed, with luminous, violet flowers and bulbous, purple fruit – doing the farm proud! As with the eggplant, the other famous member of the solanum family that took a tumble this year with multiple early deaths, was the tomato. Weather conditions have been challenging, so the mortality rate and yield were affected. 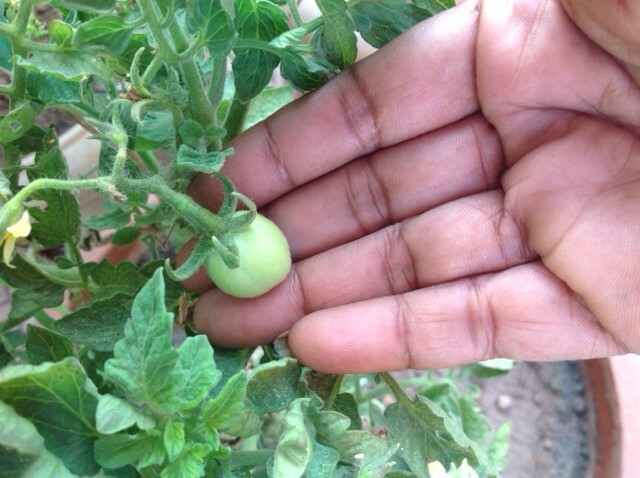 My friend Sujatha informs me that this has been a bad year for solanum plants across India. 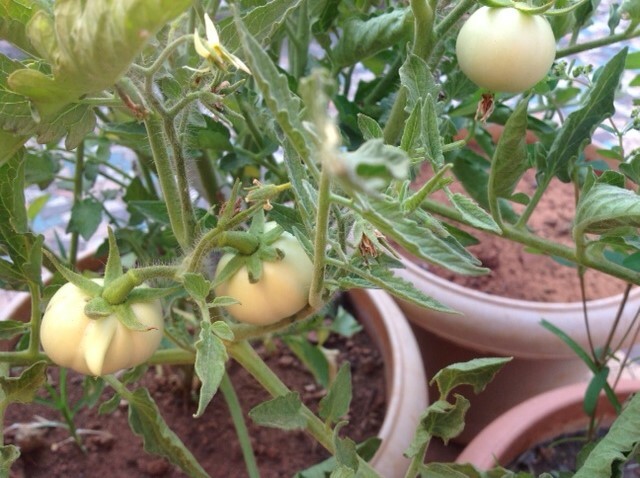 So well, one does what one can…..
And then there are the peppers or capsicum/simla mirch – also solanum family members, that are growing, but without the verve of last year. 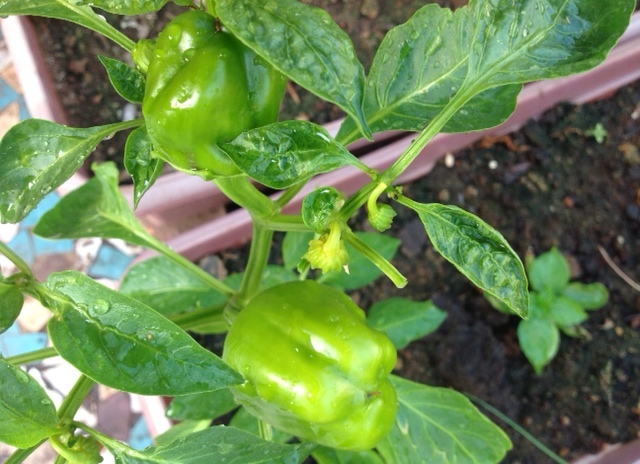 Peppers – green now, waiting for the sun to turn them yellow! In the meantime, leafy veggies were not daunted and performed very well. Green and red amaranth and dill are growing happily. 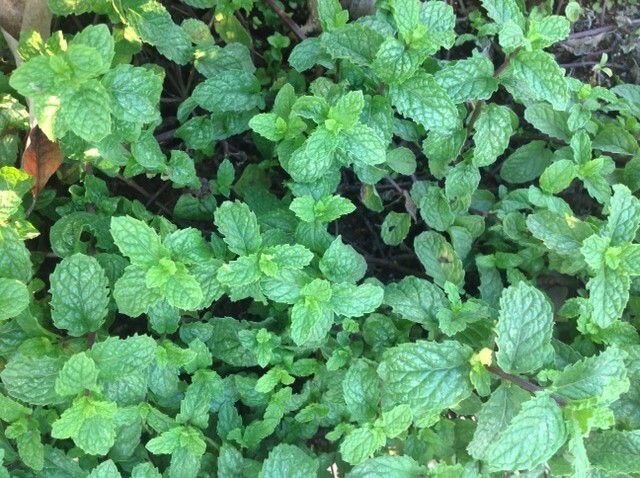 While the mint, as is its wont, is plotting to take over the entire farm. Until the next season of green surprises – and may we meet in cooler times – happy farming! This entry was posted in agriculture, Bombay, city, Container, Farming, flower, Gardening, green, herbs, Hobby, lifestyle, Organic, Sustainable, Terrace, Tropical, urban and tagged agri, agriculture, agritech, consult, container, eco, ecotech, farming, green, grow, grow own food, mumbai, organic, project, season, summer, sustainable, terrace, urban on May 15, 2014 by Mandy. Thanks – glad you liked the blog. I’ve included lots of general tips on how to grow, when to grow and what to grow specifically for the Mumbai/Konkan coast climate. Do check it out on the pages section of this blog. I plan to add more info as well…so you can always check back. Cabbage is a challenging veggie to grow in this climate. Try your hand with some more cooperative veggies like bhindi & snake/smooth gourd (summer), beans (winter) and turmeric/ginger right now. Good luck and keep growing!